Justin Hannah's "Consignment" now available on Vimeo On Demand! Justin Hannah's award-winning short film "Consignment" is now available to stream instantly on Vimeo On Demand, the popular distribution platform created by Vimeo.com. "Consignment" is available to rent or purchase from $1.99 (watch it here). 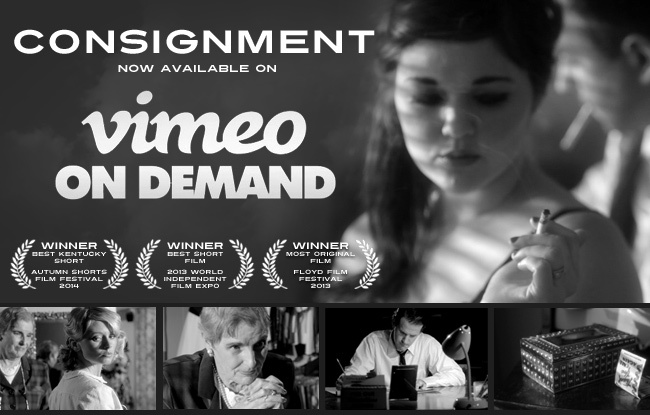 Vimeo On Demand offers independent features, short films, and series to rent and purchase, viewable through PC, television and popular devices. The platform brings filmmakers exposure to the Vimeo audience, and allows the creators the chance to profit from their work. "Consignment" is a stylish film noir mystery set in the 1950's. In the film, a desperate young woman must choose between a life of loneliness and a curse of hollow love. During its festival run, "Consignment" won the award for Best Kentucky Short at the 2014 Autumn Shorts Film Festival, the award for Best Short Film at the 2013 World Independent Film Expo, and the award for Most Original Film at the 2013 Floyd Film Festival. "Consignment" currently has a score of 8.8 on IMDB. "Consignment" is also available via IndieReign and IndieFlix.